Picnic tables with integrated permanent canopy tops—a very cool combination that produces comfortable and inviting seating areas. These canopy tables offer mild sun protection with a steel perforated or diamond pattern arched canopy and feature complimenting table tops and seats. Canopy Tables are perfect fixed attractions to enhance parks, playgrounds, forest preserves or business complex outdoor areas. Engineered to wipe clean with ease and dry quickly, these low maintenance table top and seat surfaces are finished in an impact resistant polyethylene coating. 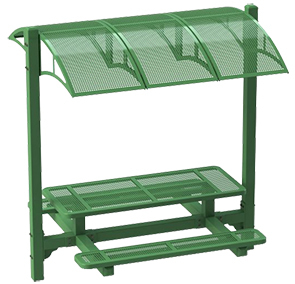 Constructed with 4" square tube structural steel, MIG welded support arms and dual pedestal frames are protected in a superior powder-coated finish. Two-post design will be appreciated by landscape crews for easy accessibility during maintenance.